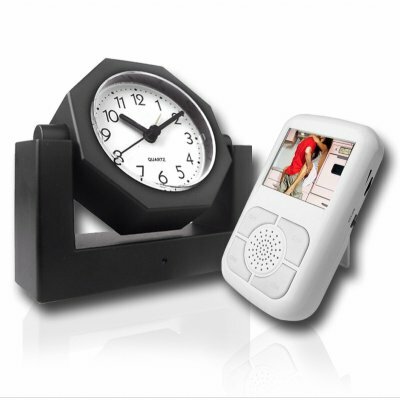 Successfully Added Covert Wireless Camera Alarm Clock + Receiver w/LCD to your Shopping Cart. Would you like to find out who's beens sneaking around your room or sleeping in your bed? This cool standard looking alarm clock, packs more that just the time. Have we have already got your imagination going wild yet? There is no doubt that the camera alarm clock with receiver has many desirable applications. We all enjoy playing James Bond, in this case you may "enjoy" the item yourself, catch someone in the act, or simply use its features for the purpose of security in your home or office. Receive crystal clear video with this wireless 2.5 inch LCD screen and see some of the minute details of the cameras surroundings. With design, quality and performance in mind, this model will keep you busy and bring you lots of guilty pleasure. Buy today at Chinavasion's excellent wholesale price and use our drop shipping service to get it straight to your store or customers doors quickly with no hassle. The camera clock makes a great item for anyone interested in covert surveillance, perfect for fun and security, and available at a budget price. Does this Covert Wireless Camera support any memory storage device such as an SD card for recordings? No, this Covert Wireless Camera Alarm Clock only comes with an AV out function.